Phil Crews, professor emeritus of chemistry and biochemistry at UC Santa Cruz, is among five awardees chosen by the Camille and Henry Dreyfus Foundation for the 2016 Senior Scientist Mentor Program. The award provides a $20,000 grant to emeritus faculty in the chemical sciences in support of undergraduate research to be conducted under their guidance. 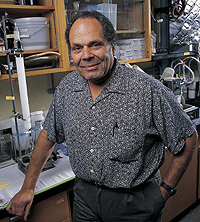 Crews has mentored undergraduate researchers throughout his career at UC Santa Cruz. In 1994, with a grant from the National Institutes of Health, he founded the ACCESS program to introduce community college students from underrepresented backgrounds to research opportunities at UC Santa Cruz. Crews, who retired from regular teaching duties in 2012, maintains an active research laboratory. He was awarded an Edward A. Dickson Emeriti Professorship for the 2015-16 academic year. Established in 1946, the Camille and Henry Dreyfus Foundation is a leading non-profit organization devoted to the advancement of the chemical sciences.